NAS boxes are nigh on perfect devices for storing and streaming your multimedia collections—music, video, and photogoraph—throughout your home. Traditionally, however, that streaming hasn’t included UHD/4K/2160p video, which requires a fair bit of CPU power. Enter Synology’s DS216+ (the box Synology sent us for testing) and it’s new DSM 6.0 operating system. Before you get too stoked. Synology’s NAS boxes can only transcode 2160p to 1080p (or a lower resolution, depending on the device receiving the stream). The same goes for Synology’s chief rival QNAP. That means you can stream UHD/4K, but not at its true resolution. Note that I’m talking about using Synology’s integrated Video Station player or its DLNA server. You can open any file directly and play it at full resolution if your TV or device supports network browsing and has the computational horsepower. Tears of Steel playing inside Synology’s browser-based Video Station. Videos up to 1080p play quite well in the app, though this 4K rendering was very jerky. The $300 (drives not included) DS216+ is one of Synology’s faster consumer NAS boxes—the reason the company sent it to us to test the transcoding. It’s outfitted with an Intel Celeron N3050, 1GB of memory, and with two drive bays, so you can add up to 16TB of storage. In our copy tests, writes and reads of a single 20GB file proceeded at about 109MBps, and with a more strenuous 20GB mix of smaller files and folders, at about 63MBps. That’s fast for consumer-grade NAS, and it makes the DS216+ a very good repository for backups—more on that subject later. The inclusion of an eSATA port on the DS216+ is a bit old-school for a modern SOHO NAS box. The DS216+ has two USB 2.0 ports on the back, and a single USB 3.0 port on the front for copying files to the box. There’s a dedicated copy button on the front panel: Pressing it will transfer all the files from a USB drive to the box. There’s also a single gigabit ethernet port, and somewhat oddly for a small office/home box of recent vintage—an eSATA port. A full-on USB 3.x (5Mbps/10Mbps) port would be a better fit for the intended market. To test transcoding and streaming I loaded the DS216+ with numerous test files, including about a dozen 2160p (UHD 3840x2160 and 4K 4096x2160) videos. I played files using Synology’s in-browser Video Station player; streamed them to Windows Media Player augmented with the LAV DirectShow filters; and as a control test, played them back directly using Media Player Classic Home Cinema. which was also set to use the latest version of the LAV filters. Everything up to and including 1080p played or streamed fine. 2160p videos (AVC and HEVC) played well also, at least those limited to about 30 frames per second and around 6 megabits per second (HEVC) or 20Mbps (AVC). AVC is a lot easier to process than the more heavily compressed HEVC. Beyond that, both audio and video stutter began to creep in; 60fps files weren’t recognized. My only other complaint is that the downscaling in Video Station could have used more anti-aliasing in areas with lots of fine detail. As I mentioned up front, you can bypass the streaming and transcoding to play files directly if your device supports playing files from network locations. Doing that with MPC-HC, everything played just fine, including 20Mbps/60fps 2160p. Synology’s audio support is nothing short of fantastic. The list of supported types includes FLAC, MP3, WMA, M4A, Ogg, Ape, both Apple and Windows lossless, as well as all wave files from 44.1kHz/16-bit to 96kHz/32-bit—including 5.1- and 7.1-channel surround types. That’s everything I have in my collection of test files outside of Opus and an ancient VQF file that’s long outdated. You can play any of the supported types using the included Audio Station app or streamed via DLNA. Supported image formats include JPEG, BMP, GIF, PNG, and TIFF. DSM or DiskStation Manager is the operating system for Synology’s NAS boxes. As with rival QNAP’s QOS, it’s a full windowing system that works within your browser. Words can’t do it justice, so look at the picture below. It works just like Windows, Linux (which it actually is), or OS X with clicking, dragging, lasso-ing, etc. No, that’s not Linux, it’s the DiskStation Manager operating system that works inside of your browser. Opera in this case. Version 6.x brings the operating system into the 64-bit world, which is of marginal value to most home users, but will allow more onboard memory in the Synology’s high-end boxes. DSM 6.0 also supports Btrfs (B-tree file system) with its copy-on-write (COW) technology that allows for easy cross-device storage pools and data snapshots. Beyond streaming multimedia, just some of the other things you can do with a Synology NAS box are record and browse the output of at least one Webcam, create your own email server, and—its newest feature—collaborate with other users on spreadsheets. No doubt word processing and presentations will eventually be added to the mix. Then there’s the ability to watch and record TV (with a USB tuner attached), Wi-Fi connectivity (with a 802.11x dongle attached), and more. There’s also a new MailPlus app and server that supports up to five users for free. It’s quite a bit slicker than the normal MailServer application and has dedicated apps for Android and iOS devices. Speaking of which, Synology provides mobile apps for viewing images, videos, etc. stored on the box. There’s a lot more, but I’ll have you visit Synology’s website for further details. Though this article is focused on multimedia serving, the DS216+ and DSM 6.0 also provide excellent backup services. In addition to Time Machine support for Macs, this Synology offers its own Cloud Station with clients for Windows, OS X, Linux, Android, and iOS. Yes, you can keep all your PCs and mobile devices backed up to the Synology box. My only issue with this was that during a rather large 400GB initial backup, the client used too much bandwidth. There’s no throttle setting, so I had to pause the sync process when I needed to use another network application. Synology’s backup options are numerous and impressively capable. New to the mix are an improved version of the Backup & Restore app called Hyper Backup Vault, and Snapshot Replication, which leverages the new Btrfs file system’s snapshot capabilities.You can also sync multiple NAS boxes (even other vendor’s, if they support RSync) anywhere in the world. There are also apps that back up and/or sync to S3, Glacier, DropBox and other online services. 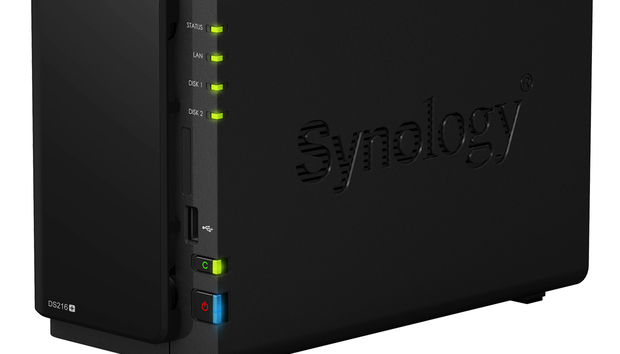 The Synology DS216+ is a great little box, and streams multimedia as well as any NAS box in its class. If you’re looking for a central repository for your songs, photos, and movies that any device in your house can acces, you could do far worse. But if you’re not dead set on the 2160p transcoding, you can get away far cheaper with other NAS boxes—including Synology’s less-expensive models, of which there are many. When simply opening and playing files from a network drive, I’m able to play 4K/UHD files just fine from a far older Synology DS411 Slim. DSM 6.0 brings Synology’s boxes up to snuff in terms of backup, replication, snapshots, and spreading storage across multiple devices. Those are features more of interest to business users than multimedia mavens, but they're welcome nonetheless. One caveat on the whole NAS for multimedia deal: Streaming and accessing files on a NAS box is simple enough for anyone, but setup requires a fair amount of tech savvy.